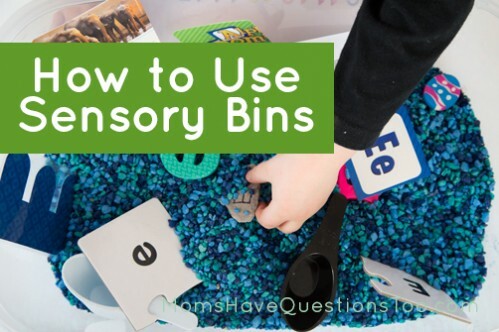 How can I use sensory bins to teach my child? I’ll be honest, I resisted sensory bins for a long time before I started using them with my kiddos. They just seemed too simple to be as great as everyone said. The truth is, kids need things that are simple. They thrive with simplicity. I also learned that my kids love a brand new sensory bin and can stay busy for a long time with it, but only when it’s brand new. So, I have to change things up frequently which means using sensory bins in a new way each time. Here are 6 great examples for how to use sensory bins. After that, there are also 2 bonus sensory ideas using playdough. Don’t forget to enter the giveaway at the bottom for a chance to win your own sensory bin starter kit. 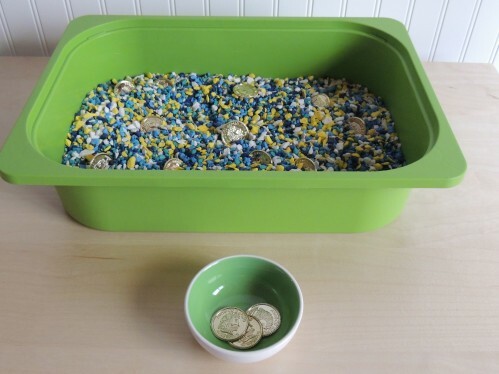 Put small objects (like gold coins for St. Patrick’s Day or egg fillers for Easter) in the sensory bin base (rice, sand, dried beans, etc.). 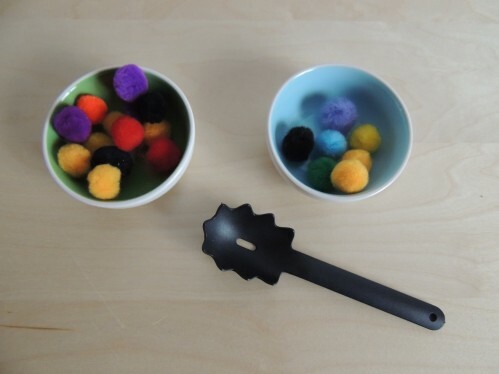 Hunt for the objects using hands or even a spatula. 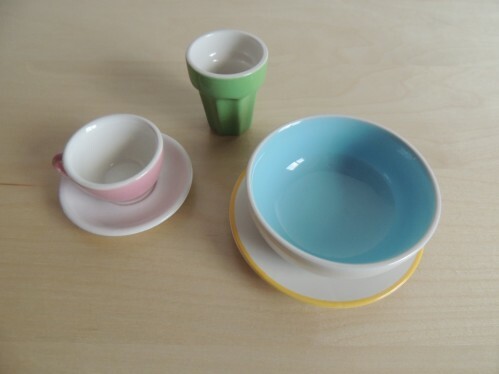 Put objects in a bowl until they are all found. Set up sensory bin with finger puppets, animals, dinosaurs, people, flowers, etc. Let child create stories to act out using the pieces in the sensory bin. Try to leave it as open ended as possible so your child can use his or her imagination. We all know that kids can be careless and often break things. 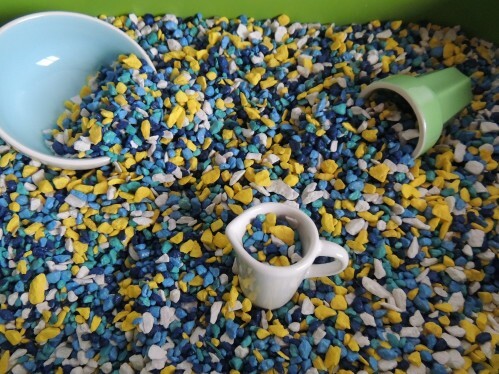 By using ceramic or glass in a sensory bin you give your child the opportunity to play with things carefully. It won’t happen overnight, but in time your child will learn to take care of objects better. Scooping and pouring teach fine motor skills as well as hand eye coordination. They may seem unrelated, but these skills really help with writing. Use cups, bowls, ladles, etc. to scoop and pour sand, dried beans, small rocks, dried rice, etc. Transferring and spooning also really help with fine motor, hand eye coordination, and writing. Pour sand (or water, rice, beans, colored sand, etc.) from a pitcher to a cup. Spoon small rocks into a bowl. 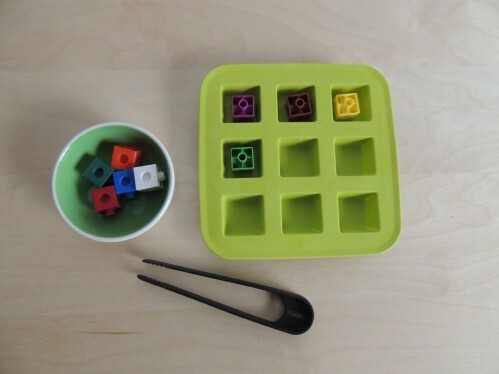 Transfer pompoms from sensory bin into an ice cube tray using tongs. Tongs are an especially great transferring item because they help a lot with correct pencil grip. Also, using an ice cube tray for the pompoms teaches one to one correspondence which is an important math skill. 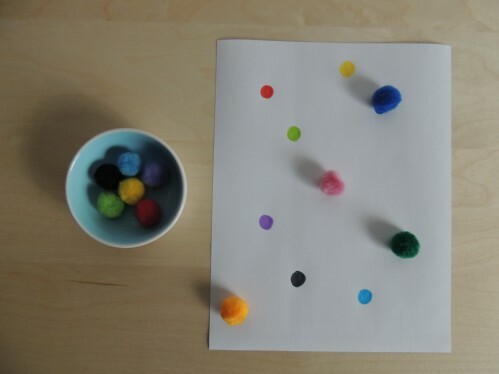 Using stamp pens or dot markers, stamp circles onto a blank piece of paper. Transfer pompoms (or math cubes, buttons, etc.) onto the colored circles using tongs. Playdough is an amazing sensory material for many reasons. It is very open ended so your child can play a different way every single time. It requires finger and hand strength to manipulate which will really improve writing. It appeals to many senses especially if you use scented playdough like this. 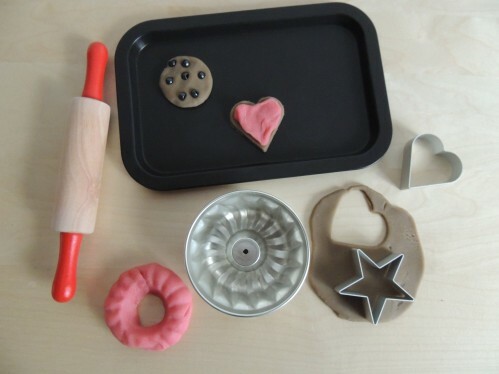 Classic play-doh or homemade playdough are both great too. 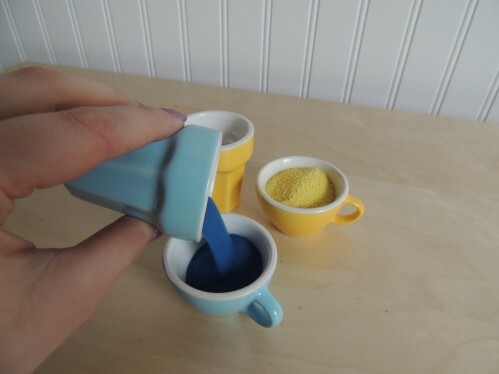 Here are two fun ways to play with playdough. 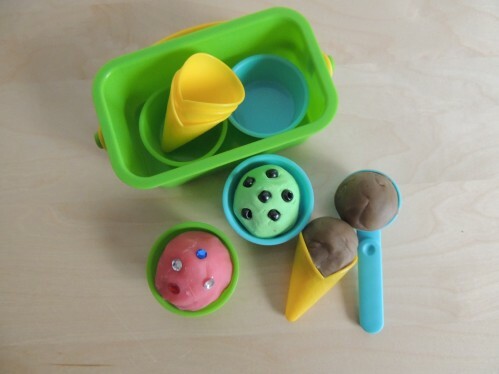 Use this ice cream set and make ice cream cones and banana splits with playdough. Add vanilla extract, strawberry extract, or cocoa powder to make your playdough smell like ice cream. Use glitter or jewels to look like sprinkles. If you want to do sensory bins with your child, but need some supplies to get started, never fear! Just join the giveaway. This giveaway is for a sensory bin “starter kit” and it includes a green sensory bin, a 5 piece utensil set, and a 10 piece cup and saucer set. All items have been provided by IKEA and I can attest to their quality. I have been using these items long before this weekend and I love them! These items give you almost everything you need for a complete sensory bin. 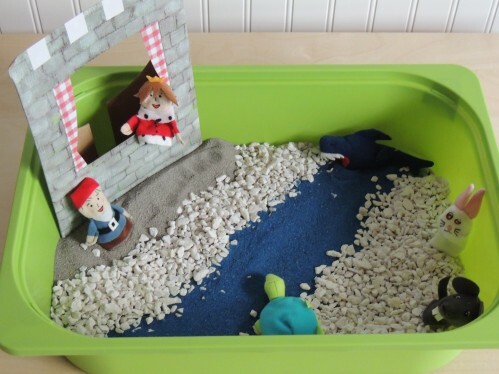 Just add a sensory bin base (colored sand, dried beans, aquarium gravel, cotton balls, shredded paper, etc.) and you are ready! Giveaway ends in one week on Saturday March 15. Check out my other sensory bins (scroll to bottom) and tot trays for more sensory teaching ideas. Follow me on pinterest, facebook, twitter, or google + for updates on my latest posts, or join my monthly newsletter (see sidebar). If you have a toddler, check out my Toddler Curriculum which is only $14.99!